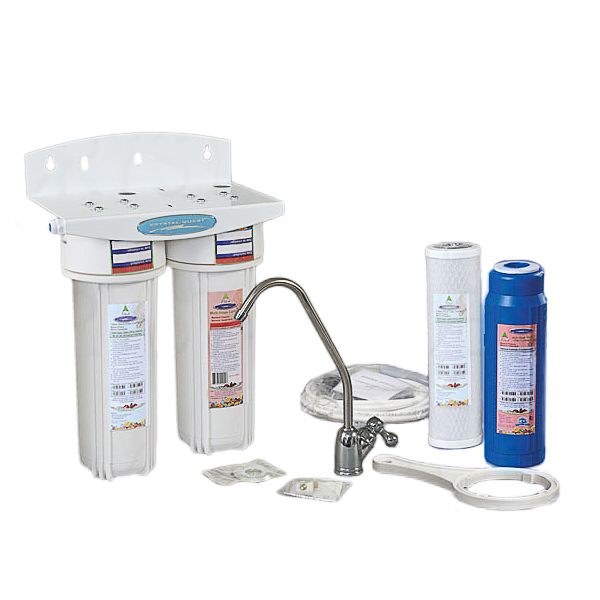 Dual Undersink Water Filter, 7-Stage - two cartridge filtration system by CRYSTAL QUEST(Also known as Mega 2000). 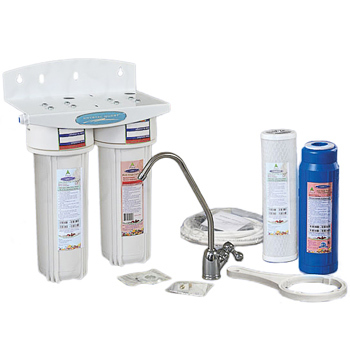 This Under Counter Water Filtration System saves kitchen counter space and employs a multistage cartridge with a solid state water filter that uses the latest technologies in blending the adsorption capabilities of coconut shell activated carbon(GAC) with Eagle Redox Alloy and more. Another cartridge designed into this system, Solid Carbon, removes Volatile Organic Compounds (VOC's, insecticides, pesticides and industrial solvents). Its 7-stage filtration process eliminates hundreds of impurities from tap water giving your family a continuous supply of pure, great tasting and healthy drinking water. The perfect solution for any household, apartment or office. Combination of Solid Carbon, Granulated Activated Carbon(Coconut Shell) and Eagle Redox Alloy. Dimensions(LxHxW): 10"x14"(10"+ 4" to change cartridge)x5"
** Another available system that does not include a faucet is the Voyager Undersink Inline Filter Series(CQE-IN-00306, CQE-IN-00307 and CQE-IN-00308).